The recent market study published by the company – 'Gastrointestinal Infection Testing Market: Global Industry Analysis 2013-2017 & Forecast 2018-2026', does comprehensive assessment of the most important market dynamics. On conducting detailed research on historic as well as current growth parameters of the gastrointestinal infection testing market, growth prospects for the market have been obtained with maximum precision. The report discusses exclusive and significant factors that are likely to have a huge impact on the development of the gastrointestinal infection testing market during the forecast period. The report will help market players modify their manufacturing and marketing strategies to visualize maximum growth in the gastrointestinal infection testing market in the coming years. The report provides detailed information about the current and future growth prospects of the gastrointestinal infection testing market in the most comprehensive way for the better understanding of readers. The report commences with the executive summary of the gastrointestinal infection testing market, which includes the summary of key findings and key statistics of the market. It also includes the market value (US$ million) estimates for the leading segments of the gastrointestinal infection testing market. Readers can find detailed taxonomy and definitions in this chapter, which will help readers better understand the basic information about the gastrointestinal infection testing market dynamics, pricing analysis, list of key manufacturers and key regulation policies included in the report. Based on disease strains, the gastrointestinal infection testing market is segmented into bacterial strains, viral strains and parasitic strains. In this chapter, readers can find information about key trends and developments in the gastrointestinal infection testing market and market attractive analysis based on disease strains. Based on product type, the gastrointestinal infection testing market is segmented into reagent kits, sequencing kits and equipment. In this chapter, readers can find information about device usage, key trends and technological developments in the gastrointestinal infection testing market and market attractive analysis based on product type. Based on end user, the gastrointestinal infection testing market is segmented into hospitals, clinics/medical centers, diagnostic laboratories and research institutes. In this chapter, readers can find information about key trends and developments in the gastrointestinal infection testing market and market attractive analysis based on end users. This chapter explains how the gastrointestinal infection testing market will grow across various geographic regions, such as North America, Latin America, Europe, Asia Pacific Excluding China (APEC), China and the Middle East & Africa (MEA). This chapter includes detailed analysis of the growth of the gastrointestinal infection testing market, along with country-wise assessment for various countries, including the U.S. and Canada. Readers can also find information on regional trends, macro-economic factors and market growth based on disease strains, product type, end users and country of gastrointestinal infection testing market in North America. Readers can find detailed information about factors, such as pricing analysis and regional trends impacting the growth of the Latin American gastrointestinal infection testing market. This chapter also discusses growth prospects for gastrointestinal infection testing market in leading LATAM countries, such as Brazil, Mexico and the Rest of the Latin America region. Readers can find detailed information about important growth parameters in the gastrointestinal infection testing market in several European countries, such as the U.K., Germany, France, Italy, Spain and the rest of Europe. Readers can find thorough information about the various parameters that will impact the APEC gastrointestinal infection testing market during the forecast period 2018-2026. Japan, India, Australia and New Zealand, Russia and the Rest of APEC are the leading countries/regions in APEC and they are also the prime subject of assessment in this chapter. Readers can find information on important factors that will make a huge impact on the growth of the gastrointestinal infection testing market in China, based on market segmentation, during the forecast period 2018-2026. This chapter provides an overview of drivers, restraints and trends in the China gastrointestinal infection testing market. Readers can find detailed information on how the gastrointestinal infection testing market is expected to grow in major countries/regions in the MEA region, such as GCC Countries, South Africa, and the Rest of MEA during the period 2018-2026. In this chapter, readers can find a comprehensive list of all leading stakeholders in the gastrointestinal infection testing market and detailed information about each company, including company overview, offered products, revenue shares, key strategy and recent company developments. The market players featured in the report include Becton, Dickinson and Company (BD), Thermo Fisher Scientific Inc., Bio-Rad Laboratories Inc., Luminex Corporation, Hoffmann-La Roche Ltd., bioMérieux SA, Quidel Corporation, Illumina, Inc., Seegene Inc, Genetic Signatures and others. This chapter of gastrointestinal infection testing market includes a list of acronyms and assumptions that provide a base to the information and statistics included in the report. This chapter of gastrointestinal infection testing market will help readers to understand the research methodology followed to obtain various conclusions, important qualitative information and quantitative information about the gastrointestinal infection testing market. The gastrointestinal infection testing market is largely dominated by a few major players who are competing based on product advancements and pricing in the gastrointestinal infection testing market. Introduction of novel products by manufacturers and growing patient pool are the key factors expected to boost the growth of the gastrointestinal infection testing market during the forecast period. Companies, such as Hoffmann-La Roche Ltd., bioMérieux SA, and Thermo Fisher Scientific Inc., contribute 61.2% of the total revenue share in the global gastrointestinal infection testing market. Lack of proper medical facilities, improper sanitation facilities and unhygienic behavior of people, especially in emerging economies, such as India, China, Brazil, South Africa and Mexico, are some of the important factors leading to increasing cases of diarrheal diseases. The expanding patient pool is expected to increase the demand for better gastrointestinal infection testing options. According to WHO, In 2016, the mortality rate due to diarrhea was about 3 times more in adults aged 70 years and above than in younger children aged 5 years and above. Additionally, different geographies represent a big opportunity for medical device manufacturers. This, in turn, has been acting as a driving factor for the growth of the gastrointestinal infection testing market. Advancements in gastrointestinal infection testing have led to the development of new gastrointestinal infection testing products, which can rapidly detect infectious pathogens, such as bacteria, virus and parasites. This has led to the development of syndromic panels to detect syndromic infection. A bioMérieux company has developed a syndromic panel for several infectious diseases. Luminex has two gastrointestinal infection testing panels. In November 2016, Bio-Rad received commercialization rights in certain unidentified areas to detect microbial imbalances in partnership with Genetic Analysis. Such technological advancements are boosting the growth of gastrointestinal infection testing market. Mergers and acquisitions are the prime business strategies being adopted by companies to expand their product portfolio and to enter into new markets. In the U.S., a decrease in life science funding has encouraged companies to actively migrate their technologies for clinical applications. Several companies have made investments into clinical trials and are entering into expansion activities to enter into new market segments. Similarly, many companies are also merging or acquiring other companies that already have presence in the IVD industry. Such merger and expansion activities are pushing the growth of the gastrointestinal infection testing market. The competition section of the gastrointestinal infection testing market provides detailed information about key players competing in the gastrointestinal infection testing market based on their market shares, different market strategies, product offerings, marketing approach and company dashboard. 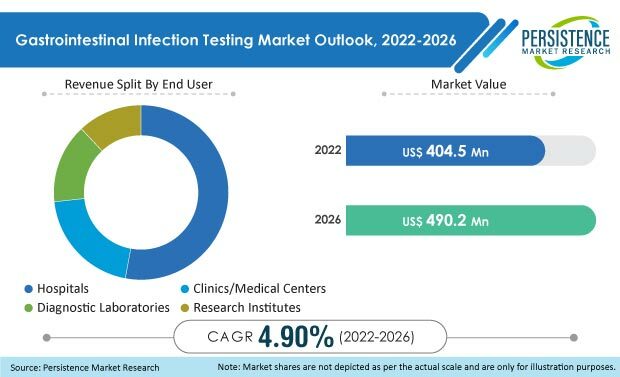 Some of the key players featured in this gastrointestinal infection testing market report include Becton, Dickinson, and Company (BD), Thermo Fisher Scientific Inc., Bio-Rad Laboratories Inc., Luminex Corporation, Hoffmann-La Roche Ltd., bioMérieux SA, Quidel Corporation, Illumina, Inc., Seegene Inc and Genetic Signatures. Gastrointestinal (GI) infections are mainly caused by a huge variety of bacteria, virus or parasites. GI infections cause irritation in the gastrointestinal tract, including both the stomach and small intestine. The symptoms include diarrhea, abdominal pain and vomiting. The company conducted a research study on the gastrointestinal infection testing market for the forecast period 2018 to 2026. This report provides thorough assessment of opportunities in the gastrointestinal infection testing market along with an understanding of the populations at risk, population groups opting for gastrointestinal infection testing, disease incidences, awareness level about gastrointestinal infection testing and competition in the gastrointestinal infection testing market. The report provides thorough information regarding macroeconomic factors impelling the dynamics in the gastrointestinal infection testing market. The report offers a wide-ranging taxonomy of the gastrointestinal infection testing market. The gastrointestinal infection testing market has been segmented on the basis of disease strains, product type, end-user and region. The gastrointestinal infection testing market has been segmented based on disease strains into bacterial strains, viral strains and parasitic strains. The gastrointestinal infection testing market has been segmented by product type into reagent kits, sequencing kits and equipment. By end user, the gastrointestinal infection testing market is segmented into hospitals, clinics/medical centers, research Institutes and diagnostic laboratories. What is the revenue potential of the gastrointestinal infection testing market across North America and Europe? Who are the key players and what are their product portfolios in the gastrointestinal infection testing market? What are the major challenges impacting the growth of the gastrointestinal infection testing market? How is the involvement of key regulatory bodies shaping the growth of the gastrointestinal infection testing market? The gastrointestinal infection testing market has been studied from a supply-demand side approach. Further, qualitative factors impacting the gastrointestinal infection testing market, such as awareness regarding gastrointestinal infection testing and treatments available, average price of devices or average cost of test, key regulations and others, have also been discussed in the market. The calculated data has been further validated through primary research, including telephonic interviews, surveys, in-person interactions and viewpoints of experienced analysts. Secondary research resources, such as databases, trade journals and verified paid sources, were used to arrive at observations drawn. The research study on the gastrointestinal infection testing market also includes top trends and macro as well as microeconomic factors influencing the gastrointestinal infection testing market.